Compare Rice Cookers: Zojirushi, Panasonic or Aroma? Is your rice not coming out always as perfect as you wished? Is it sometimes too soft, too mushy, too dry or maybe too hard? Does your rice cooking technique fail as soon as you switch to a different type of rice? Are you willing to experiment with rice types you never used before, such as sushi rice and wild rice, and still succeed? Well, in all these cases a good rice cooker will definitely help you. But, there are many rice cooker brands and types out there. Which one should you buy? 1Some rice cookers come bundled with functions such as steaming and preparing other foods. If your kitchen is already equipped for those functions, it would make more sense for you to get a unit that focuses solely on making that perfect rice. 2Nowadays, some brands use computer chip embedded artificial intelligence technology known as "fuzzy logic" that can adapt the cooking cycle to the exact quantity and type of rice you are using (such as brown rice, sticky rice, sushi rice, etc.). These types of rice cookers may cost a bit more but the results are well worth the money. Some of these brands using the "fuzzy logic" technology can produce restaurant grade results in your own kitchen. 3When you compare rice cookers, the ease of use and cleanup aspect is important to consider. If you are going to be cooking rice almost every day, you'd better get a unit with a non-stick inner pot that can be easily removed for serving and cleaning. The Zojirushi, Panasonic, and Aroma rice cookers are today among the most popular among Amazon buyers. This article will compare the most popular model from each of these brands, and provide accordingly recommendations so that you may purchase the best rice cooker for your needs. The Aroma ARC-914SBD rice cooker is made of stainless steel, measures 8.5" by 9.3" by 8.7” and can prepare 2 to 8 cups of cooked rice. It can steam foods such as vegetables or meats while cooking rice, and it can also be used to make soups and stews. It is equipped with easy-to-use digital controls for white rice and brown rice as well as for the steam and keep warm functions. The programmable digital control panel also includes a 15-hour delay timer function for flexible meal planning. All you need to do is place the rice in the cooker in the morning, set the delay timer to have it cooked when it's needed, and come back to perfectly cooked rice ready to serve. Once the rice is ready, the cooker automatically switches to keep-warm mode so there's no need for monitoring or stirring. Note that this rice cooker does not have the "fuzzy logic" technology. It comes with a measuring cup, a serving spatula, and a steam tray. The steam tray allows for healthy steaming of meats and vegetables, while the rice cooks below. The inner cooking pot is removable for easy serving and for quick cleanup. This rice cooker is the lowest priced of the three models considered here. 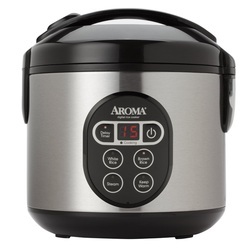 You will find the 8-cup Aroma rice cooker in the Amazon products section below. The Panasonic SR-DF101 rice cooker measures 10.2" by 13.9" by 7.8", is made of plastic and can prepare up to 5 uncooked cups of rice. It is a digital microcomputer controlled unit that uses the "fuzzy logic" technology which adjusts power depending on how much rice is being cooked for precise cooking and for more consistent results. The unit features a simple, pre-programmed control panel with four large buttons and convenient icons for selecting up to six menu functions: white rice, brown rice, porridge, quick cook, steam, or soup. It is also equipped with an automatic shut-off function that prevents overcooking, and with a keep-warm function that activates automatically when the rice is cooked, holding contents at an ideal serving temperature for up to 12 hours. Other features include push-button lid release, a nonstick-coated inner pan for simple cleanup, a detachable power cord, and an attractive, compact design that can fit conveniently on a countertop, kitchen island, or dinner table for serving. _Also included in the purchase are a steaming basket, a special measuring cup for portioning the desired amount, as well as a non-scratching rice spoon. Panasonic also makes a larger rice cooker, the Panasonic SR-DF181, that can prepare up to 10 cups of uncooked rice. The unit has similar functions to the 5-cup cooker just described. You will find both the 5 cup and 10 cup Panasonic rice cookers in the Amazon products section below. The Zojirushi NS-ZCC10 rice cooker measures 14" by 8" by 10", is made of steel and can prepare up to 5.5 uncooked (11 cooked) cups of rice. Like the Panasonic described above, it is a microcomputer controlled unit that uses "fuzzy logic". It is designed to focus particularly on cooking that perfect restaurant grade rice, so no steaming accessories are included. The programmable digital control panel includes functions such as automatic keep-warm and extended keep-warm that maintain the rice at an ideal serving temperature. There is also a reheat feature that eliminates the risk of overcooking when cooked rice is reheated. The unit provides various menu program settings for different types of rices including sushi, porridge, sweet, brown, semi-brown, mixed, and rinse-free. The thick inner pan has a nonstick coating that prevents rice from sticking, and the stay-cool side handles make handling and cleanup very easy. Accessories include a measuring cup for regular rice and another for rinse-free rice, a rice spoon holder that attaches to the side of the machine, a nonstick rice scooper, and a manual with easy recipes. Zojirushi also makes a larger rice cooker, the Zojirushi NS-ZCC18, that can prepare up to 10 cups of uncooked rice. This unit has similar functions to the 5.5-cup cooker just described. You will find both the 5.5-cup and 10 cup Zojirushi rice cookers in the Amazon products section below. So which rice cooker should you get? As mentioned earlier, if you are already equipped with a steamer, you should get a rice cooker that simply cooks that perfect rice. Usually, a utensil that focuses on a single function, does it better than a utensil that is designed to do a number of functions. When you compare rice cookers, of the three units described above, only the Zojirushi NS-ZCC10 focuses just on rice cooking. This unit is our favorite, and the one we recommend strongly. The extra money you will need to pay for having the "fuzzy logic" technology integrated into your rice cooker is well worth the perfection of the rice you will obtain every time, no matter what type of rice you use. On the other hand, if you are looking for a rice cooker with steaming functionality, you could opt for either the Aroma ARC-914SBD or the Panasonic SR-DF101, keeping in mind that Aroma ARC-914SBD does not come with "fuzzy logic" technology. Note that one can find nowadays many rice cooker brands and models that cost less than those described here. But in most of these cases, you will not have the "fuzzy logic" technology integrated, and you will be giving up quite a bit on quality and durability. If the models described above have become so popular among Amazon buyers, it is because they provide the excellent performance, upkeep, and durability features customers are looking for. You will find below the Zojirushi, Panasonic and Aroma rice cookers described above. Please click the selected rice cooker below to check the price information or to purchase. Multi-menu cooking functions: white rice (regular, softer or harder), jasmine white rice, mixed rice, sushi rice, porridge, sweet rice, brown rice, GABA brown rice and quick cooking. Triple heater (bottom, side and lid) generates heat all around for even heating. 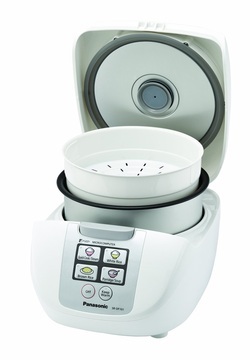 Automatic keep warm and extended keep warm functions keep rice at the perfect serving temperature. Black thick spherical inner cooking pan with detachable and washable stainless steel inner lid. Easy-to-read and operate LCD control panel with Clock and Timer functions. Delay timer with 2 settings.